This September marks the twelfth anniversary of the opening of the Paris Las Vegas. My son and I visited this 2915-room hotel and casino this past June. 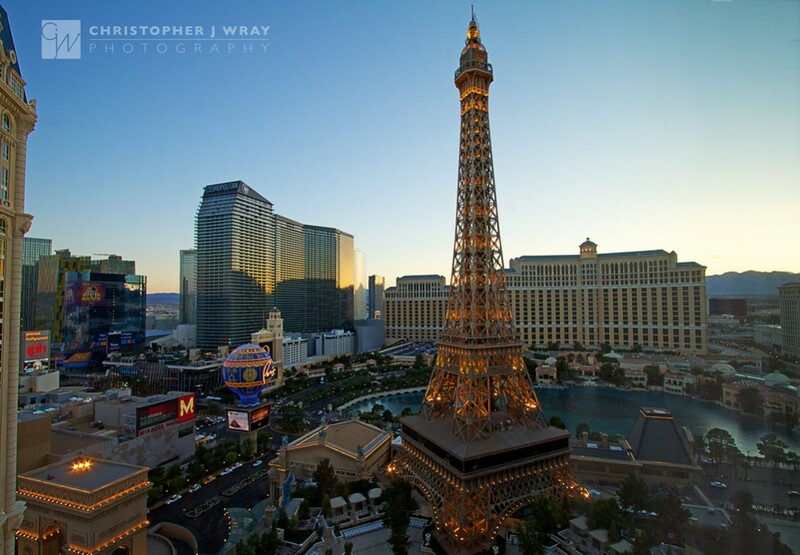 Paris dominates the Las Vegas Strip with its half-scale replica of the Eiffel Tower and partial Arc de Triomphe. The front of the hotel borrows inspiration from the Paris Opera House and the Louvre. The twilight photo above was taken from the window of our room with a terrific view of the Bellagio Hotel, Aria Resort, and Cosmopolitan. Visit my Flickr page for more photos of the Paris Las Vegas, including a night shot of the Bellagio Fountains. Oh yeh, this is AWESOME! Love the sense of scale here and the details! That’s a cool shot nice view man. I wish I was there right now, lol. Nice shot. Which lens did you shoot this with? Thanks, Matt. I used my 10-22mm f/3.5-4.5 @ 10mm. I’m not a big fan of racking my lens all the way, but when shooting distant subjects, like the architecture in this photo, the barreling distortion is not an issue.